If you were to mix a Bass with a Newcastle, you would have this beer. What? OK, if you were to mix Bass with Newcastle and dry hop it with Cascade, you would have this beer. Blasphamy!!! 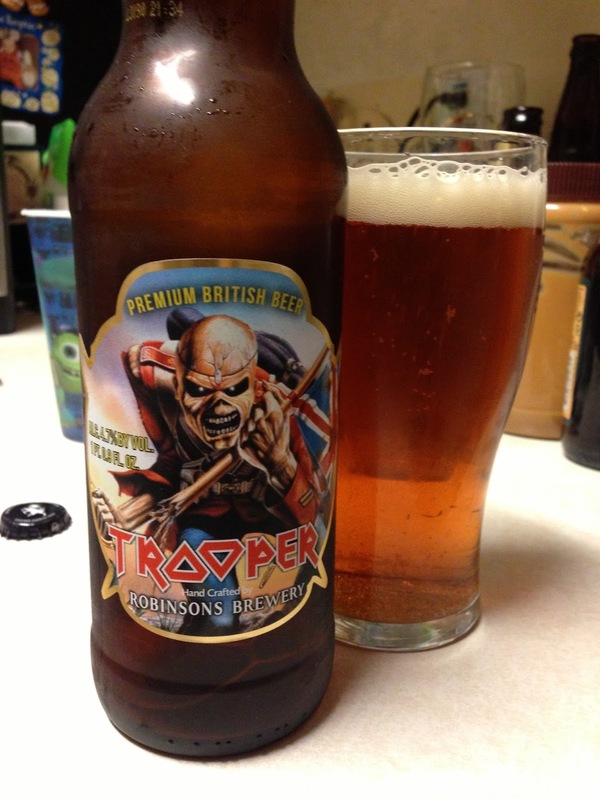 This is Iron Maiden's beer. It's gotta rock! It's gotta be special. You can't say that about this beer! Truth be told, it doesn't scream of "666 The Number of the Beast" like one would think an Iron Maiden beer would...or should. Give me a Double IPA, man! Or an Imperial stout, with some sort of evil ingredient added. You could call it Fear of the Dark. A Metal beer should be something as intense as the music. This beer is more akin to what those 50-something rockers would drink as they chill aboard their own Bowing 757, Ed Force One, cruising from country to country with rig in tow. A group who has rocked the world for 35 some years and continue rock, and to develop as a band. A band with tradition, complexity, a strong following, a legacy... No better beer than a nice traditional British Ale, a real ale, would be suitable for this band at this stage. Right? Or is there a right answer? It's not my beer. It's their's. And I'm the one who jumped at the chance to purchase a handful of the 1 pint .9oz bottles, at just $6.50 per. At 4.8% ABV it seems like it would be a wimpy beer...more like a Justin Bieber Beer. Wrong! A lot of flavor. Great aroma, from the late addition Cascade hops. Nice traditional bitterness, in the British style. The lower carbonation level gives is a true cask conditioned feel. Smooth, tasty, fresh, with a dry finish. It's not much darker in color than Bass, but with a rich maltiness that I believe surpasses Bass. A sweet maltiness often found in Newcastle when on draft, yet with a similar dry English hop finish. Perhaps it is limiting to this beer to compare with such mainstream beers. Face it, those are traditional. This beer was designed to celebrate that tradition. I think it is awesome! Love a good British ale. Any band that flies their own airplane from concert to concert is pretty f&$%ing awesome! I'm not going to say a bad thing about this beer! I'm rather going to enjoy it much. It is very nice after all. Some New Wave of British Heavy Metal anyone? One of my favorie Maiden songs. This beer and this song seem go together well.